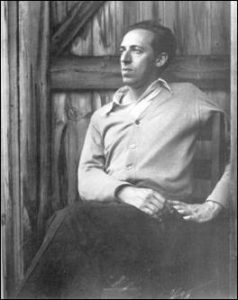 Aaron Copland (1900-1990), was born in Brooklyn, New York City into a Conservative Jewish family. Whilst growing up he, along with his other siblings, was offered music lessons. Copland became a proficient pianist, but found his interest was within composition. In his early composition career, Copland wrote a range of art songs, and with the growing trend in European music it made him want to study in Paris. Thus, Copland studied at the Fontainebleau School of Music. Whilst in Europe, Copland also travelled an extensive amount to Germany, Italy, Hungary and Austria, which further established him within the music community. His critiques on other composers, alongside his performance capabilities and composing talents equipped him to return to the USA with a positive outlook on his future career. Copland’s return to New York in 1925 was a refreshing new start for the young budding composer. He rented an apartment right by the Carnegie Hall, which kept him in the music sphere. Copland kept himself afloat financially by taking on a wealth of different jobs such as lecturing, performances, critiques and publications. However, when the Great Depression hit, Copland began travelling around Europe, Africa and Mexico. Copland also started composing for radio, as well as composing incidental music for various plays (for instance, Quiet City). Letter from Home was written in 1944, whilst Copland was in Mexico ,and it was commissioned as a patriotic work by Paul Whiteman with his Radio Hall of Fame Orchestra. Lining up with World War II, this work is a symphonic work that depicts a soldier at war reading a letter from a loved one. However, it has also been researched that whilst he wrote this work, Copland received a wealth of letters from his sister, telling him the news of his mother’s death and his brother Ralph’s time in the army. Thus, it has been argued that Copland may have intertwined some of his own feelings of grief and loneliness into this work. The work is incredibly sentimental in both atmosphere and music, which brings warmth and nostalgia to an increasingly difficult situation. The piece starts with a reminiscent clarinet solo, which is then shadowed by the strings. From the beginning, this work brings warmth and serenity. The use of the middle range of the winds and strings brings comfort, and this is a general theme throughout the piece. Then comes a trumpet solo, which perhaps depicts a memory for the soldier in question (or perhaps Copland himself). These solo themes are then responded to by the strings, and the theme is fully developed – just like recalling a memory. The timbres heard in these call and response sections are really warm and the oboe and flute play a primary role in leading the themes into the next section. The work seems to be leading to a climax, which perhaps is depicting the emotion that the reader is feeling, and once the climax is heard the tone of the piece changes slightly. Extremities of ranges are heard and the horns play a triumphant role in bringing a well-rounded sound to this emotional section. The texture is stripped right back again and the winds play a polyphonic melody until the strings enter once more with a similar melodic cell from the beginning. The trumpet also returns, playing part of the previous solo, however this time muted – perhaps signifying the weakening of the memories. The oboe also joins in here and develops the theme. There are some welcome dominant-tonic cadences which brings back the idea of comfort and ‘home’. The use of different instruments playing the main themes evokes a sense of nostalgia, and the different instruments represent a range of different people. The sections played by just the strings give a really pensive feel to the music, and even though it feels like a fairly happy piece, there is also a hint of sadness within the music. The work is incredibly poignant and I am sure it gave much comfort to those who felt homesickness in that sad time. Letter from Home is a work that evokes feelings for both the ‘character’ that Copland had in mind for the work, but also himself and his feelings of homesickness. The work is sentimental, warm and brings comfort and gives us an insight into how it may feel to read a letter from a loved one. I absolutely love this piece and I believe it is one of Copland’s best compositions.